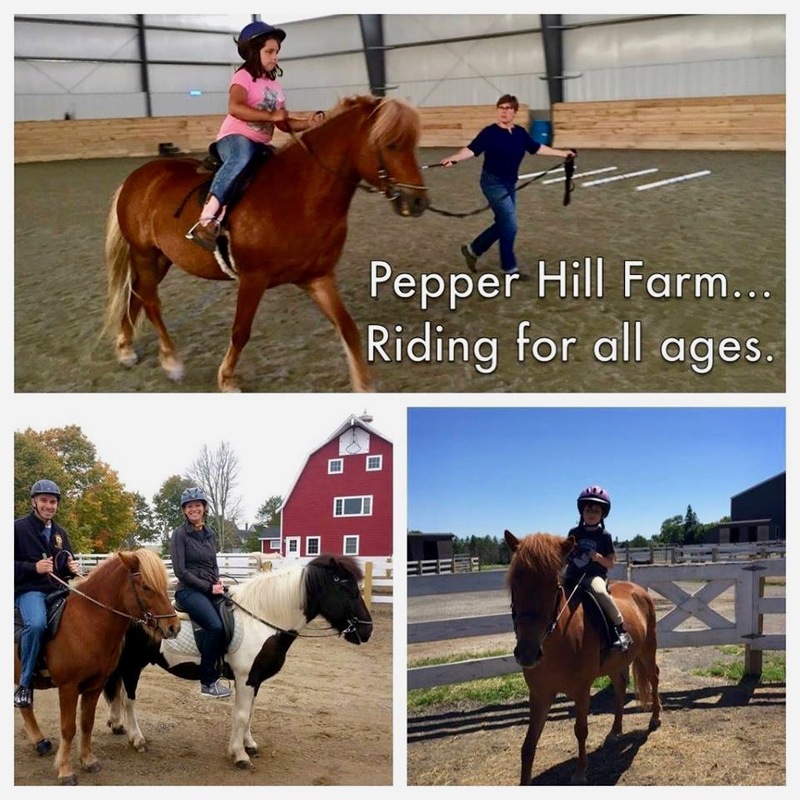 LESSONS: Pepper Hill offers a variety of lesson options to suit every rider’s needs. We offer beginner to intermediate and children’s lessons programs. Beginning riders are started on the lunge line to develop their seat and balance and to develop confidence and teach riders how to use their aids effectively. Within a lesson, students are taught about the equipment and cleaning that goes along with equine care. Lessons can be scheduled 7 days a week / rain or shine. PARENTS / ADULT RIDERS: Did you ride when you were younger and want to get back in the saddle? Join our Adult Lesson Program. Call or text for details – 207.230.9552. $30/hour group – $50/private hour. This summer we are offering programs where riders can advance their horseback riding skills, expand their horsemanship knowledge, and have fun being here on the farm with our Icelandic horses. 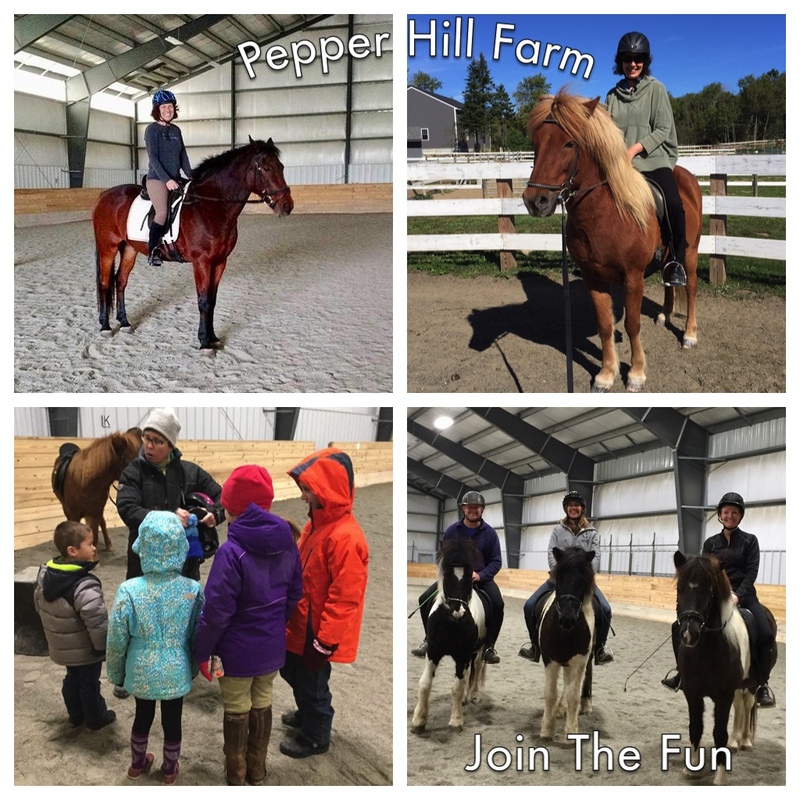 The programs will incorporate instruction in grooming, tacking up, and riding as well as the basics of horsemanship and horse care. Instruction will be tailored to the rider’s level of ability. Beginners with no prior horsemanship experience are welcome! Each 3-day session will be on Monday, Wednesday and Thursday from 9 AM until 12 PM, $200 per rider per session. Single day sessions (9am-12pm) $70. Sessions are available from June 26 through August 31. Please call 207–230–9552 to sign up. Icelandic Horse Trail Rides: 90 minute introduction to Icelandic Horses give you the opportunity to learn why Icelandic horses are so unique. Available 7 days a week; you will have the chance to get to know your horse in our indoor or outdoor arena. Your guide will demonstrate the various gaits and assist you with your questions. Once you are comfortable you will be riding the trails thru our woods and fields on the farm with your guide. We also have an onsite track which gives the horses good footing and distance to show off their gaits and their very smooth ride. $75 per person. Please call or text for availability and additional information 207-230-9552.